One of the items common here in Italy that I think is a wonderful invention is the kitchen cabinet with the built-in dish drying tray. They are mounted above the sink and look just like the rest of the kitchen cabinets until you open the doors. Inside there are usually two metal racks where you place the dishes as you wash them so they can drip dry. No piling them up on the counter, but put comfortably into the cabinet out of the way and out of sight. Plus for those of us who do not like to dry dishes this is a very practical use of kitchen space. I want one of those! I've only heard about them before, never seen one. Wonderful invention! What is the word for that in Italian? How can someone in the US buy one of these? Chuck, I'mnot sure what the name is for this cabinet but I do know I was never able to find anything like it in the US. You might try an Ikea store. What about mould and mildew? Are there vents or a fan to provide air circulation. Might smell a bit musty with thw doors closed for a while. Where does the water go? Is there a drain built in? Mark and Freidrich - The bottom of the cabinet has a tray that slides in and out to catch the dripping water. This is not a tight seal and the are large gaps around this tray so there is plenty of air movement. The ones I've used were in cabinets without bottom, so drainage and circulation were unrestricted. 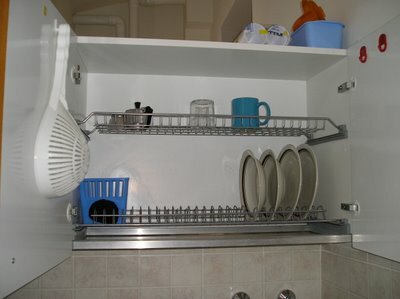 Zojila.com sells the drying trays to put in cabinets. Also, at drycupboard.com one can buy a dvd on how to convert your cabinet to one of these. Instead of drain trays underneath, I've seen these cabinets mounted over the kitchen sink.